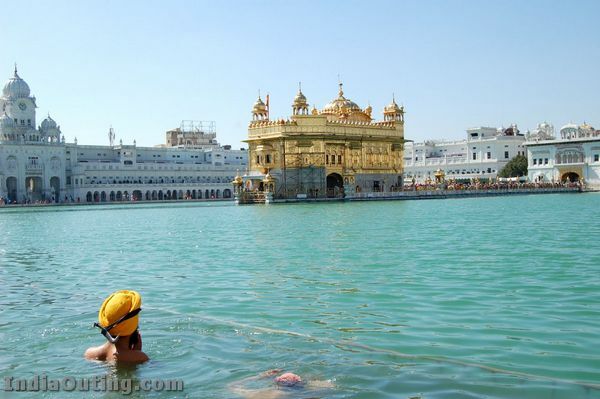 The name of the city derives from the name of the pool around the Golden Temple (aka Harmandir Sahib) and means “holy pool of nectar” (Amrit: elixir; Sar: (short for sarovar) lake). 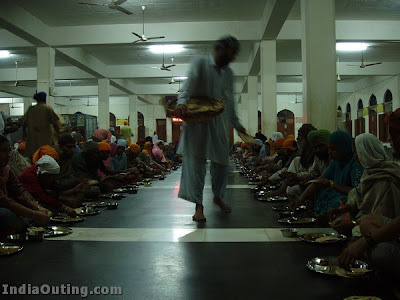 It is the spiritual and cultural center of the Sikh religion, and they are rightfully very proud of the city and their very beautiful and unique Gurdwara (place of worship). The Golden Temple was initiated by Guru Ramdaas Ji, the fourth Sikh Guru, and completed in 1601 by his successor Guru Arjan Dev Ji. It is now a major pilgrimage and tourism center. Raja Sansi International Airport (IATA: ATQ)  is about 11 km and a 15-20 minutes drive from the city center. It’s one of the modern airports in India and quite adequate if not exactly exciting. Most flights are to Delhi, an hour away, but there are an increasing number of international connections: Jet flies to London, Air India flies to Toronto via Birmingham, Singapore Airlines flies directly to Singapore and Air Slovakia flies to Bergamo, Barcelona and Birmingham via Bratislava. There are also surprising numbers of flights to Central Asia (eg. Turkmenistan, Kazakhstan). Amritsar (IR station code : ASR) is an important railway station and is well connected to major cities in India through daily trains. Onward/return trains can be booked online, at the train station or, most conveniently, at the small booking office in the Golden Temple Complex.Long-distance taxis are available from most places. It takes around 6-7 hours from New Delhi via NH-1. 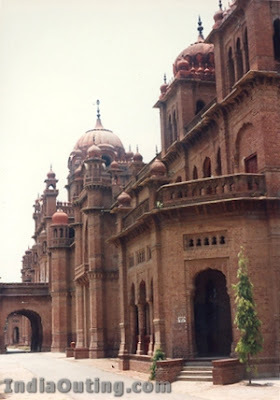 Amritsar is well-connected by bus to most major cities and the northern areas within a days drive. Pathankot is about 2.5 hours away, and there are daily direct buses to New Delhi, Jammu, Katra, Chandigarh, Dharamsala (once daily, ~6 hours), etc.You can find Volvo buses from Chandigarh , Delhi and Katra to Amritsar. From Pakistan If coming from Wagah at the Pakistani border, take a cycle-rickshaw (Rs 15, 3km) to the Attari station, where you can catch a local bus to Amritsar (Rs 15, 25 km). Taxis also use this route and charge around Rs 200 for the entire vehicle. 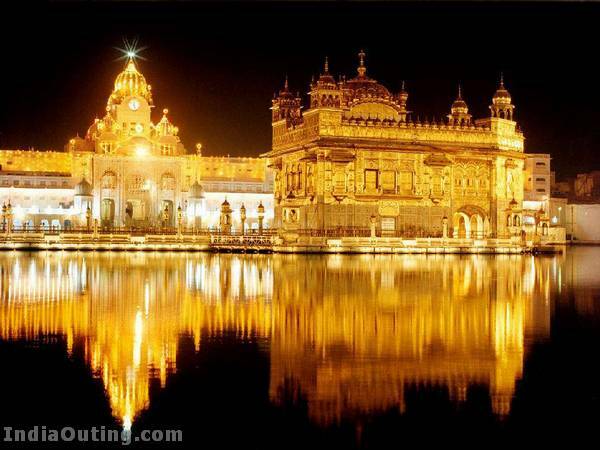 The Golden Temple is the main attraction in the city, and the most important religious place to the Sikhs. It’s a stunning complex, and always full of thousands of pilgrims from all over India, excited to be at a place that they usually only see on television. The excitement to be here is infectious, and many people will be more than happy to tell you all about their religion and customs, and show you around the temple itself. 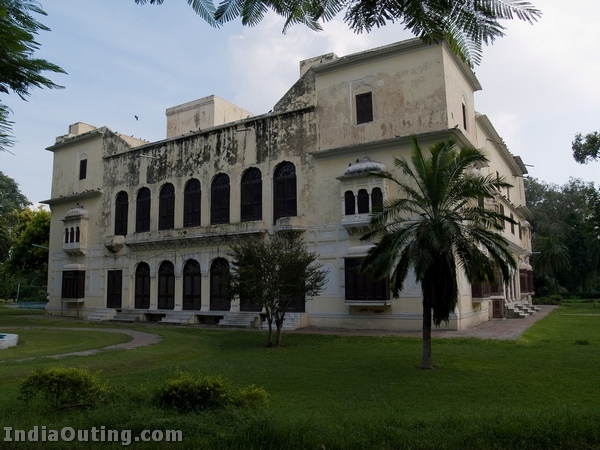 Cover your head, remove your shoes and wander around one of the most amazing places in India. The complex is open almost 24 hours (from 6 AM until 2 AM) and is worth visiting twice: once during the day, once at night, when it’s beautifully lit up.As you arrive near the complex, you will more likely than not be accosted by hawkers trying to sell you bandannas to cover your head. It’s not a bad souvenir for Rs.10, but there’s also a big barrel of free ones to choose from at the entrance itself. Deposit your shoes at the subterranean building to the left of the entrance, wash your feet at the entrance and head in. The Golden Temple offers free accommodation to pilgrims and tourists in very basic dorms or 3-bed rooms in Guru Ram Das Niwas, behind the temple. While free, donations are expected (Rs 50-100 minimum per person per night is appropriate). You should also remain quiet and respectful of the surroundings, keeping in mind that this is a holy place of pilgrimage more than a tourist attraction. Alcohol and smoking are strictly forbidden, not only within the temple complex but anywhere within eye-sight of the temple complex. If you can handle that, then this is arguably the best place to stay – watching people go about their routine, talking to the pilgrims, and absorbing the gorgeous atmosphere. Put your donations in the donation box near the entrance to Ram Das Niwas, as opposed to the guards who will ask you for it when checking out. 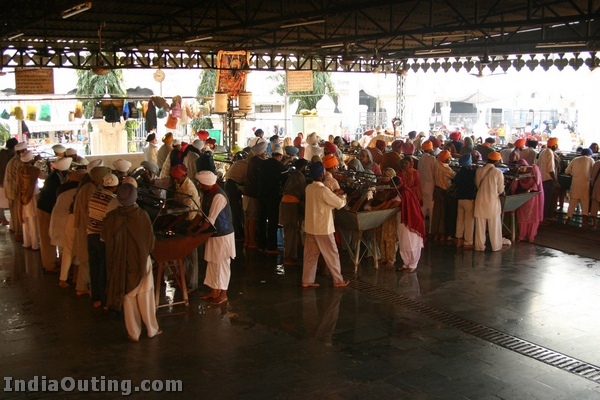 The Golden Temple has a dining hall (langar) serving free basic meals to all… A definite must for visitors. Plates and spoons are handed out near the entrance, then follow the crowds inside and take the next vacant spot in one of the rows on the floor. Servers come by with large buckets of dal, chapatis and rice. Make sure to finish everything on your plate (wasting food isn’t an option here!) then take it outside to volunteers at the washing area. It’s inside the complex which means no shoes and cover your head. Darshani Deori. This is the main entrance, sporting a distinctly Victorian clock-tower. Harmandir Sahib. 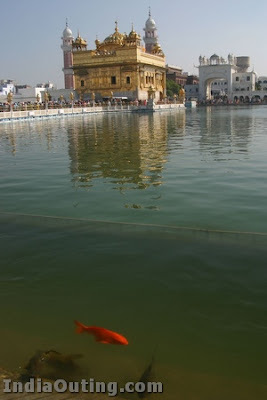 This is the Golden Temple itself, floating above the Amrit Sarovar, housing the sacred Adi Granth scripture which is recited out loud during the day. This is the most crowded point, accessible by a bridge from the edge of the pool, and entry here is regulated by guards. Akal Takht, directly opposite the Harmandir Sahib. Meaning “the Timeless, this is where the highest council of Sikhs sits and deliberates. 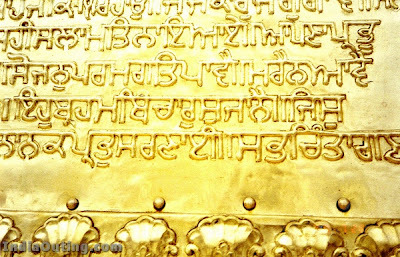 At night, the Guru Granth Sahib is taken to the Akal Takht. All Sikhs are expected at some point in their lives to volunteer for a week at the temple, and everyone you see working here is fulfilling that duty. It’s likely possible that you can join in if you feel so inclined – you could start by chatting up the people outside peeling vegetables, or those washing dishes. 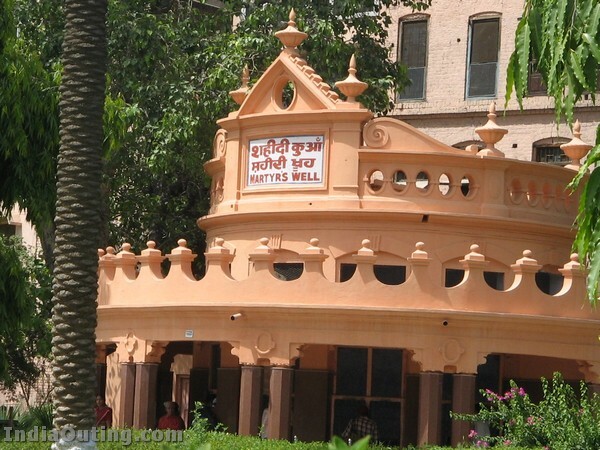 Jallianwala Bagh (Garden) is a short 5-minute walk from the Golden Temple, and is the site of the 1919 Amritsar massacre. 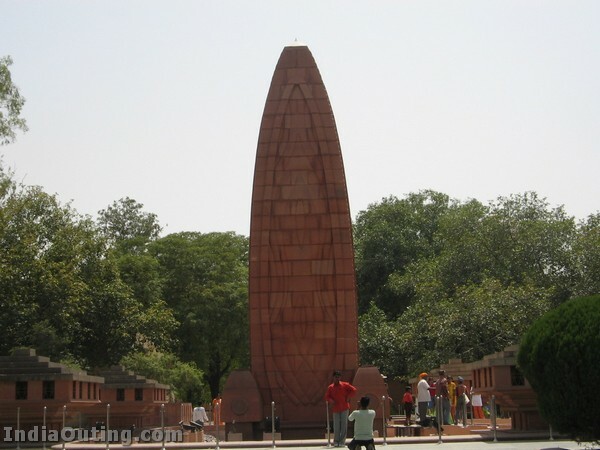 On April 13 of that year, British Indian Army soldiers opened fire on an unarmed gathering of men, women and children. 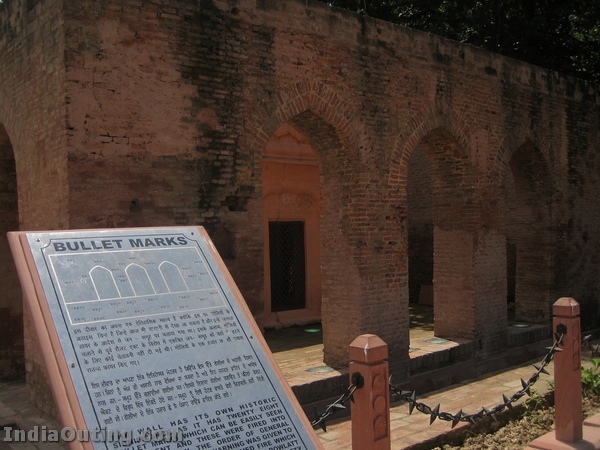 The firing lasted about 10 minutes and 1650 rounds were fired, killing 1579 people.A memorial was built on the site and inaugurated by the then-President of India, Dr. Rajendra Prasad, on 13 April 1961. to this day the bullet holes can be seen on the walls and adjoining buildings. 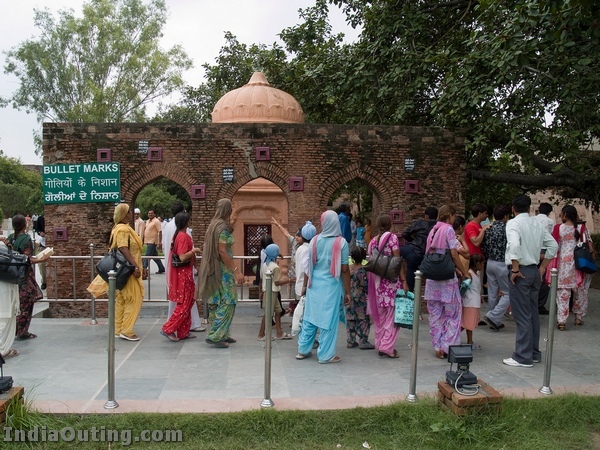 The well into which many people jumped and drowned attempting to save themselves from the hail of bullets is also a protected monument inside the park. 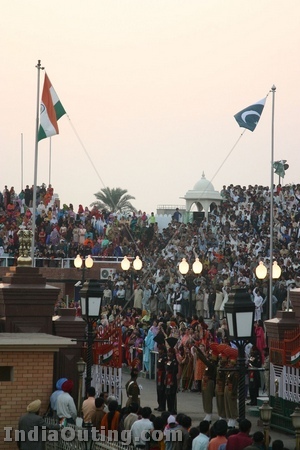 Visit the Pakistan border at Wagah to see the border closing ceremony. Indian and Pakistani soldiers do a march-off every evening, a popular and fun event. Taxis leave from the backside of the Golden Temple. It’s a 45 minute ride, and you should leave Amritsar by around 3:30PM. 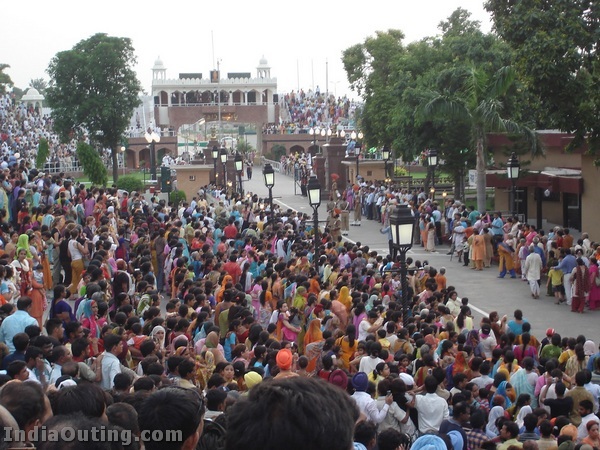 There is daily flag raising and lowering ceremony at Wagah Border, done with overblown pomp and ceremony that involves lots of tall soldiers in massive turbans goose-stepping about and slamming gates. Both the Indian and Pakistani border forces do this and it has become a tradition and people from both sides gather and see this. This holy city is a place of peace. 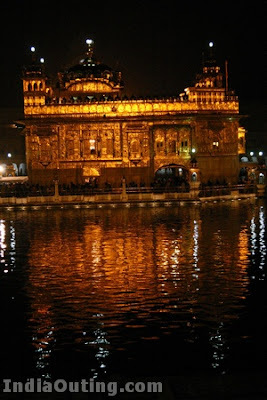 the picture depicts cultural glory and rich historical importance of amritsar.nice photos! Amritsar and Punjab-both are pride of India! THERE IS HAND WRITTEN GRANTH SHAIB IS IN DABAR SHAIB. 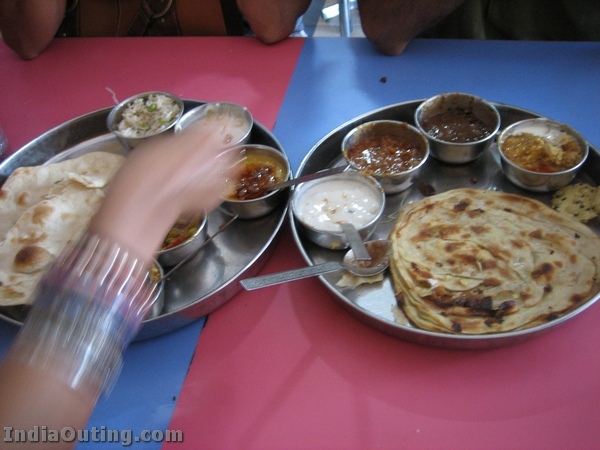 FAMOUS THINGS TO EAT:- AMRITSARI KULCHE, & IN NON VEG AMRITSARI FISH., AMRITSAR’S VADIYA IS ALSO FAMOUS IN PUNJAB( ALSO MENTION IN FOLK SONG). AT END I ONLY SAY AMIRTSAR IS THE CITY WHICH IS HOLY AS WELL AS REMIND US OUR FREEDOM FIGHTERS WITH THEIR STRONG EFORT WE TODAY WE LIVE IN THIS FREE COUNTRY. SO IT IS REQUEST TO ALL INDIANS PLZ DON’T FIGHT . WE RE ALL SAME . GOD IS ONE. ALL GURUS OR SUFIS WEATHER THEY RE HINDU MUSLIM OR SIKH TEACH US THT GOD IS ONE . BELIVE IN GOD . PLZ DON’T FIGHT . LIVE TOGETHER. THTS WHY HARMANDIR SHAIB HAS FOUR DOORS THE MAIN AIM OF IT THT PEOPLE OF ALL DIRECTION , RELIGION RE WELCOME TO THE MANDIR OF GOD( THTS WHY IT IS CALLED HARIMANDIR )& WE ALL THE PEOPLE OF GOD. so very beautiful we can not explain……. Excellent pictures thanks for showing…. 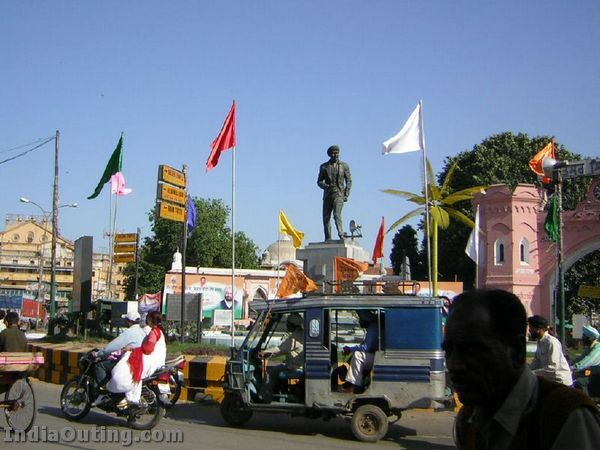 It is undoubtedly wonderful to spend one’s whole childhood there.. i have and i am so proud that it is my birth place. there is no words to define about amritsar and esp golden temple, its next to impossible to explain how i feel to see all picture and red about amritsar city. i will defi go there. Very nice & holy place where everything goes spiritually. this is really beautiful your mails are very helpful to collect historical details thanks. Great peaceful & spiritually raising place. BEAUTIFULL, FANTASTIC; I dont have more words……. I really like this pictures of India, and I really would love to go visit very soon from the USA. It is one of the wonders of the world. I have not been there but I can feel how beautiful is this place. Your post is excellent. 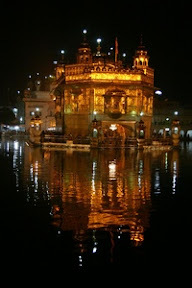 Amritsar is truly the holy city and is worth visiting. You just missed to mention the culture of Punjab. I would just like to suggest a link which you can refer for culture of Punjab. its so beautifull.& its nice pic……….! awesome place to visit during winters….luv to be here….